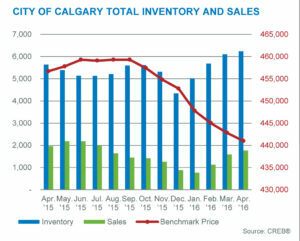 Calgary, May 2, 2016 Market imbalance in Calgary’’’s residential resale housing market continued to weigh on citywide prices in April. Much like the previous month, year-over-year sales fell while new listings increased, resulting in inventory gains across all sectors of the market. Some buyers in the market are still not willing to pull the trigger because they expect even bigger discounts. For sellers, the reality of seven consecutive months of price declines has started to sink in, said CREB® president Cliff Stevenson. “From re-considering the listing of their home to lowering expectations on price, sellers are beginning to adjust to the current market reality,” he said. “However, some buyers in the market are still not willing to pull the trigger because they expect even bigger discounts. And so that gap between buyers’ and sellers’ expectations still persists across many product types and locations.” Despite this, the detached sector fared better relative to the other sectors of the market. While detached sales activity has fallen by over four per cent so far in 2016 compared to last year, the sales to new listings ratio improved in April. This prevented sharper inventory gains and caused months of supply to move toward more balanced levels. The same cannot be said of other market sectors. Year-to-date apartment and attached sales declined by a respective 19 and 13 per cent compared to last year. Slower sales, combined with rising inventories, ensured that market conditions continued to favor buyers in these segments. “While the weak economic climate is influencing demand, the apartment and attached sectors are further impacted by increased supply in the competing new home sector and rental markets,” said CREB® chief economist Ann-Marie Lurie. “This is one of the contributing factors to the steeper price declines recorded in the apartment sector.” Since the start of the price declines, monthly un-adjusted benchmark apartment prices have declined by 7.6 per cent, while semi, row and detached have declined by a respective 5.9, 4.6 and 4.1 per cent.